Melancholia was heralded by what was, in light of the cloud of controversy that has followed Lars von Trier and his work, a predictably controversial furore at this year’s Cannes Film Festival. As it was, the outrage-by-numbers that saw the director saw the director praising Hitler and subsequently declared persona non grata for the remainder of the festival seemed pretty limp, tired, not particularly scandalous yet risked completely overshadowing the film itself. It is, then something of a relief that the proper release of the film (out now in France, September 30th in the UK, November 4th in the US) has been relatively distraction-free, even if it has emerged somewhat under the radar in the middle of the summer break with apparently minimal promotional support. This at least means we can talk about the film without the distraction of scandal, a relief because Melancholia is a strong, approachable film that deserves to be appreciated on its own terms. In a similar way to Antichrist, Von Trier’s provocative 2009 film Melancholia is partially a product of von Trier’s own sessions of analysis to treat his own depression. It is split into two parts, the former relating the tale of Justine, played by Kirsten Dunst, a character in thrall to depression on what proves to be her disasterous wedding day. The latter part focusses on Claire, her sister, (Charlotte Gainsbourg), set against the background of Armageddon. A family-oriented drama collodes with an apocalyptic sci-fi tale in this second part of the film, Justine, Claire, her scientist (and space geek) husband John played by Kiefer Sutherland are watching, with dread and excitement, the approach of the planet Melancholia, itself on a collision course with the planet Earth. Whilst the film can be viewed in terms of these two contrasting halves, the two very different narratives might best be examined considered concurrently. The planet Melancholia also symobilises Justine’s depression, as unavoidable and as damaging, and experienced in a similar way, by the depressive to the end of the world. Von Trier’s depiction of Justine’s melancholia (and thus an implicit reflection of his own battles with depresson) is of a different order to how depression is often examined. Sigmund Freud, for example in his seminal essay ‘Mourning and Melancholia‘ (1917) presents depression/melancholia as having a distinct, rational, explainable basis in that it is built around a profound sense of loss, in a similar structural way to mourning. For Von Trier’s Justine, however, there is no easy identification that can be made in this way (aside, arguably a hinted at breakdown of her parents relationship, and a difficult relationship with her mother). Melancholia is a force, one that resists explanation or cure and as a condition is treated both with sensitivity and respect. When viewed in context with Antichrist it again seems to be a resolutely female force, irrationality contrasted with the male hyper-relationality of Sutherland’s scientist, or Willem Defoe’s psychiatrist. It is tempting to ‘read’ the motifs presented in von Trier’s film and attempt to unlock hidden meanings in the film. 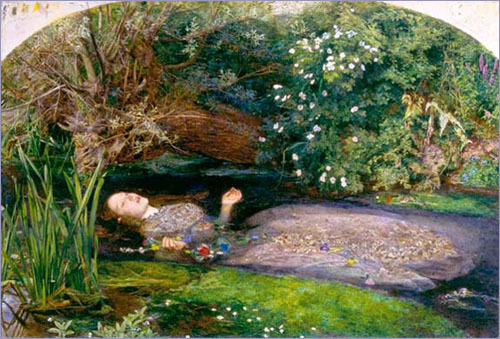 The allusions to pre-Raphaellite painting, such as Millais’ Ophelia, suggest such a route of critical inquiry might be rewarding, but the possibility always remains in a Von Trier film that they might be red herrings. For all the intellectual clues hinting to a deeper meaning, however, Von Trier, is as much concerned, as ever with the instant cinematic experience – the genuinely hilarious wedding planner played by Udo Kier, seemingly parachuted in from Father of The Bride seems designed to undermine such a reading and to puncture any such intellectual pomposity. That said, I’m fascinated by the choice of Justine for the name of Dunst’s character, which she shares with one of the Marquis de Sade’s notorious heroines. In Sade’s Justine (1791), the eponymous heroine is on a quest for virtue, which descends into an inescapable world of vice. At the end of the novel, she is finally saved from vice and is able to devote herself, finally to virtue. This redemption, however, swiftly sees her sink into depression, and she is killed, bizarrely, after being struck by lightning. For Von Trier, Dunst’s Justine seems similarly cursed, her own compulsion towards vice is destined to ruin her wedding way. For Sade, Justine’s death is a form of punishment from God, this seems to resonate in Melancholia by the inevitable natural disaster which closes the film. Is Von Trier making a broader statement about how contemporary society deserves a similar punishment? What does Justine’s day job in advertising tell us about contemporary virtue and vice? It doesn’t seem right to compare Melancholia with Hollywood blockbusters, but the cinematic release and the casting of an all-star cast (particulaly Sutherland star, of the all-action TV series 24), this is what Von Trier seems to be asking us to do. As with Antichrist, it is aesthetically of a similar order to much good video art (Bill Viola, for example), particularly the film’s opening segment. It is an aesthetically striking, and ultimately, hugely emotionally moving film (I sat in the cinema for a good few minutes in silence after the final scene). Von Trier’s approach seems very similar to that of Antichrist, although in a much less visceral and shocking way. Whilst Antichrist is a deconstruction of a horror movie, with all of the standard tropes reassembled, Von Trier seems to be taking a similar approach in Melancholia. Rather than a horror movie, he takes the tropes of the disaster movie, the impending disaster, the scientists getting it hoplessley wrong, then way a disaster forces characters to reconsider their relationships with each other – and subverts them. Sutherland, for example, rather than being a Jack Bauer-style hero wimps out as soon as the going gets tough. We are a long way from Independence Day. Reportedly, von Trier is not particularly find of Melancholia, primarily because it is his one of his most mainstream films to date, Whilst eminently still not a mainstream movie, it is a considerably more approachable film than Antichrist or Dogville, but this doesn’t negate von Trier’s avant-garde nartistic triumph. Melancholia deserves to be a huge success. Go see it before the moon crashes into Earth.